Published by: Matagot, Pegasus Spiele, Swan Panasia Co., Ltd.
"The expedition is about to land on the shore. The scouts we've sent came back wounded, but have confirmed the information we had: not all dinosaurs have disappeared! On this island, a female velociraptor lives with her babies. So far we've seen five of them, but there might be more. Raptor is a card driven boardgame with tactical play and some double guessing. Players use their cards to move their pawns (scientists on one side, Mother and baby raptors on the other) on the board. Every round, the player who played the lowest ranked card can use the corresponding action, while his opponent has movement / attack points equal to the difference between the two cards values. 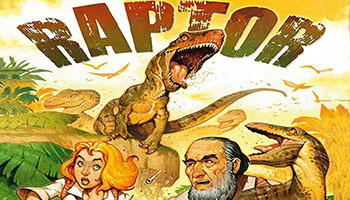 The scientists can use fire, can move by jeep on the tracks, and can even call for reinforcements, while the mamma raptor can hide in the bushes, yell to frighten the scientists, and call for her babies. Move a baby that is awake onto a free space of your choice on the tile where the mother is located (a baby that is already on the same tile as the mother can move to another space). This move must be carried out without crossing spaces that are occupied or on which there is a fire token. Then, shuffle your draw pile and your discard pile (including this card) to form a new draw pile. Put one baby raptor to sleep. The baby raptor must be located on the same tile as a scientist or on an orthogonally adjacent tile. Lay down the baby raptor figurine. The Raptor player will have to spend 1 action point to put this baby back upright, but cannot do it in the same turn. Then, shuffle your draw pile and your discard pile (including this card) to form a new draw pile.